Our first afternoon on our mission trip in Rio de Janeiro, our team passed out food to nearby homeless men and women. The “gringos” in town definitely caught the attention of people who hadn’t noticed the church on their street in a while. 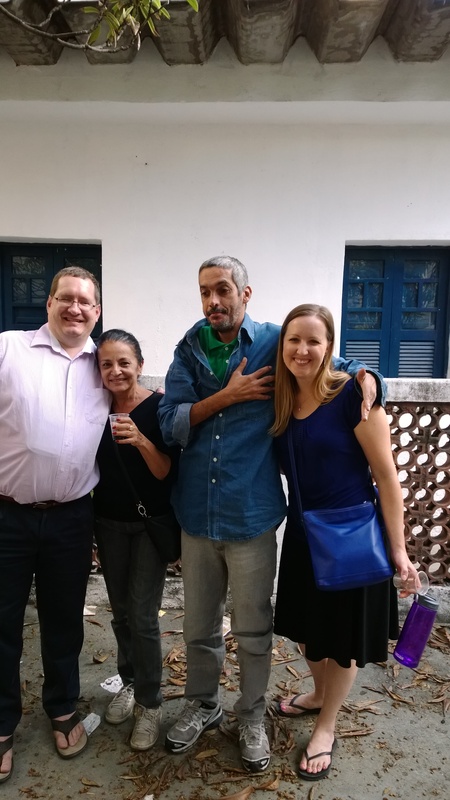 Since only one of our team members spoke a little Portuguese, meeting people was typically a “no falo Portugese” smile and hand gesture. (Translation: I don’t speak Portuguese, but I want to say hi anyway!) I was frustrated not being able to communicate easily. I always know it’s going to be an issue overseas, but it’s still annoying. I wanted to hear their stories and actually talk with them. We had translators, but it still felt like I was on the outside of the conversation. I know the churchy ‘right’ answer to my annoyance of not speaking the local language. I know that smiles and gestures go a long way, there’s nothing impossible with God, and He’s bigger than our circumstances and limitations. I get that. And, I’ve seen Him do awesome things in spite of language differences. But, it’s still really annoying to me when I can’t verbally communicate. I didn’t know he was crazy, at first. All I heard was him rambling in Portuguese, which I didn’t understand, anyway. We translated a few short lines before I noticed people treating this guy a little differently than the others we’d met. Greg, one of my teammates who knew some Portuguese, started interacting with him while I inquired what was going on. They said he was crazy. He had mental problems, and he’s talking gibberish that no one could really understand. I smiled. Finally- someone I could talk with! I spoke English, he would respond in Portuguese, and both of us were more than okay with it. My Brazilian friend kept telling me he couldn’t understand me, that his words didn’t make sense, but I didn’t care. I was speaking English, anyway. I’ve worked with many people with mental disabilities, but this guy had spiritual issues debilitating him; I discerned it in my spirit. So, I put on my spiritual armor and asked God to guide me. I asked one of our translators to ask him what his name was, and he said “Batman!” You could tell he thought his answer was pretty funny. I thought it was, too. He mumbled on about something else, but the locals wouldn’t translate it because it didn’t make sense. What I began to see was a spirit of rejection and misunderstanding. I saw it pour out from most of “us” as the church, and it was being poured out onto him. It seemed God was showing me something bigger than just this guy. It seemed like this was a typical spiritual situation in which the church was responsible for casting judgement on someone. Whether right, wrong, or indifferent, we added to whatever problems the world and circumstances had thrown his way. I’m definitely guilty of being part of that problem. So in that moment, I wanted to be part of the solution. I think most of us did, even though we had no idea how to go about it. While everything I was discerning was overwhelming, and on the outside he did seem absolutely crazy, I just kept staring in his eyes. All I could see was Batman. The Protector of the city. The one who not many people knew beyond what they could see, but who was full of more love and compassion and justice than the world had yet uncovered. His gibberish conversations had the emotional appeal of a man passionately declaring truth. God helped me see the Jesus in him. I began to pray for an unleashing of the Holy Spirit. I prayed for spiritual break-through, for grace and mercy to be abounding, for love to cast out fear and misunderstanding, and for hope to push it’s way into all doubt inside of us for its reality to come to the surface. So, I kept praying in my head, all the while continuing to make eye contact with him. We talked back and forth, not really making any sense in the natural form of language. He kept looking right into my eyes saying what seemed to be very important gibberish. I kept looking right back into his eyes, praying. Looking back, it was probably the most intense conversation I had all week. On the outside, I’m sure no one else noticed much of what was going on, but I believe a spiritual encounter was happening. One in which some basic needs were met, some truth was revealed, some compassion was exchanged, and some rejection was counteracted by acceptance. Batman needed some soup, someone to listen to him and interact with him, and someone to see Jesus in Him and call it out. I needed someone to talk with in Portuguese, and I needed to see Jesus in circumstances beyond my understanding. We both spoke a little truth into each other’s lives that afternoon. I’m not sure if it was more for him or for me, but I left there knowing I met Jesus. In Batman. Amen! This was absolutely beautiful and encouraging to read. The spirit transcends language. Or rather, the language of the Spirit is what was being spoken. I believe you are accomplishing far more than you realize. Blessings on your journey! Thanks for the encouragement, StephAnn!